Bali Spa This is the spa in the long-established hotel in Sanur, “Inna Grand Bali Beach.” It’s good access and can stop by on the way back from sightseeing in Ubud and Safari & Marine Park. Although as a hotel spa , they offer reasonable price for all menus. Especially, 2 hours long package menus are recommended. After taking treatments, free use of sauna and Jacuzzi. Special combination of body massage with popular techniques of Indonesia, Swedish, Hawaiian, Thai acupressure points and stretching using aromatherapy oils. A deep therapeutic tissue massage using palms pressure. An old Balinese traditional recipe of spice oils are than applied with long firm strokes. This creates energy and a felling of well-being. Massage with special strokes certain to relax and leave you with fond memories. It’s both powerful & gentle invigorating and soothing with rhythmic grade. Primarily a deep, invigorating massage technique used to nurture the spirit, to experiences whole stage of being relaxed and refreshed. ★Car Charter Day's Option ＄ 33.88 More Cheaper! Use fragranced essential oils from natural plants in Bali. Smooth and gentle massage leads your body and spirit to relax. Reflex zone on the feet and hands are stimulated by our therapist, and this treatment made your body well-balanced. This therapeutic massage is directed on the loosen tight muscle in the neck, shoulders and back. This simulating cleansing treatment consist of massage your body with fresh avocado, promotes relaxation, removes dead skin cells, and cleanses the pores. Moisturize the skin, leaves skin clean and soft after treatment especially for dry skin. A gentle moisturizing run using natural Balinese honey and sesame seeds to exfoliate and removes dead surface skin, resulting in a sorter and smoother skin enriched and smelling deliciously like honey. A unique Boreh mixture application healing clay, temulawak, black rice and benzoin on the whole body to exfoliate and soften the skin. This luxurious treatment will being with a traditional massage which flows into exfoliation scrub using yellow colored spices and herbs followed by yogurt rub down. 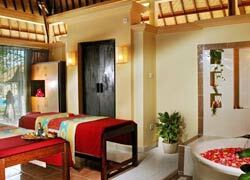 A smoothing soak in scented flower bath and a “Jamu Elixir” are provided to complete this treatment. ★Car Charter Day's Option ＄ 54.45 More Cheaper! A facial witch deeply cleanses the skin, by exfoliating the outer layer of dead skin with ingredients selected for your particular skin type. Choose one from Aloevera/ Seaweed/ Carrot/ Herb. 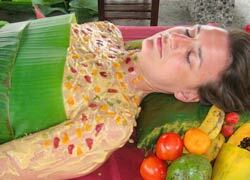 Natural facial with honey, lime, and cucumber. It’s effective for cool down red-skin after sunburn. Please apply for this course over 2 persons. In addition, we ask at least 1 week prior booking due to reserve Yoga trainer. Transport offer for Sanur, Kuta, Seminyak, Jimbaran Nusa Dua & Ubud area on request. Female： 50 therapists　Male： 4 therapists　★If you request male therapist, please let us know when you book. Available Sauna and Jacuzzi (Fee). Please bring your own bathing suit. There are many relaxing chairs. I felt very good after having massage from head to sole of the feet. I was very satisfied by polite and friendly staffs. Flight fatigue was relieved and I felt fresh.